I’ve been absent from the blog for a loooong time. I spent my winter break interning in Boston and had a great experience (not to mention a lot of fun). Back in the ‘Cuse now, and definitely going to be updating this more with recipes. I don’t have class two days a week, so I’m spending that time doing things I love, like cooking more. After cubing the tofu, spray a baking pan with cooking spray and place tofu in it. I seasoned with garam masala and then sprayed again, but you could just do salt & pepper (or whatever spice you want). Bake in 350* oven until crispy (30-60 minutes). Cook soba noodles in boiling water (as you would with pasta) for just a few minutes (usually about 4-5) until tender, then drain. For peanut sauce, combine a small amount of water with a large spoonful each of brown sugar and peanut butter. Squirt in sriracha, rice vinegar and soy sauce, then stir all of the ingredients together and add more of any of them to taste. Toast the almonds in the microwave — spread them on a small plate in a single layer, then microwave for around one minute. Cut veggies into very small pieces. Drizzle canola oil into skillet (~1 tbsp) and add all veggies. Once kale cooks down, add in tofu and noodles, then slowly add the peanut sauce and the almonds. I served it with sliced comice pear on the side (sort of tastes like a hybrid apple/pear, with very porous flesh). And then…brunch today also turned out worthy of a recipe post on here. Combine egg whites, milk and coconut milk, a few shakes of cinnamon, vanilla and maple syrup in a bowl. Soak each piece of bread in it, but not for too long or it’ll get too soggy to put in the pan. In one skillet, add a big drizzle of canola oil and put slices of banana in it to cook on low heat until they caramelize (as a topping for the french toast). In another skillet, spray very well with cooking spray (mine is EVOO spray but canola works also). Add in the pieces of bread (one at a time is easiest in a small-ish skillet). Flip the toast once it’s browned a bit. 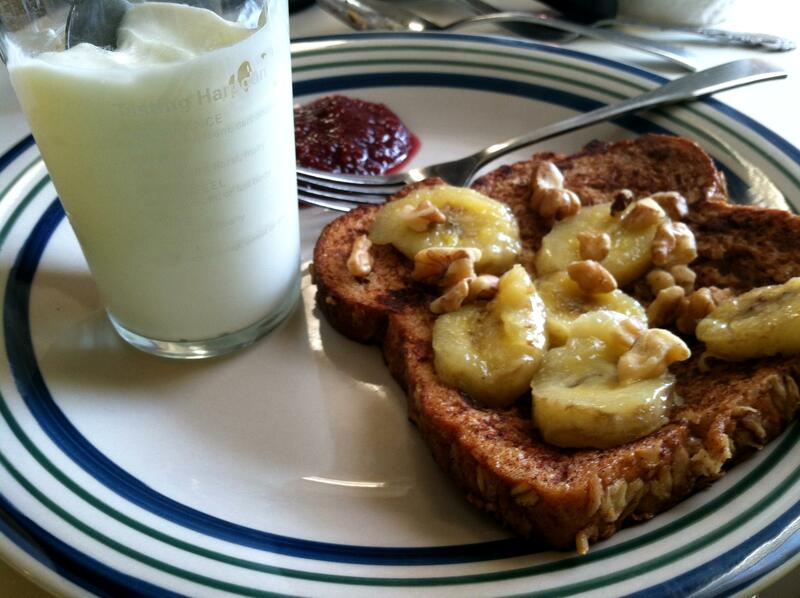 Top each piece with the caramelized bananas, pieces of walnut and either maple syrup or jam (both are yummy). 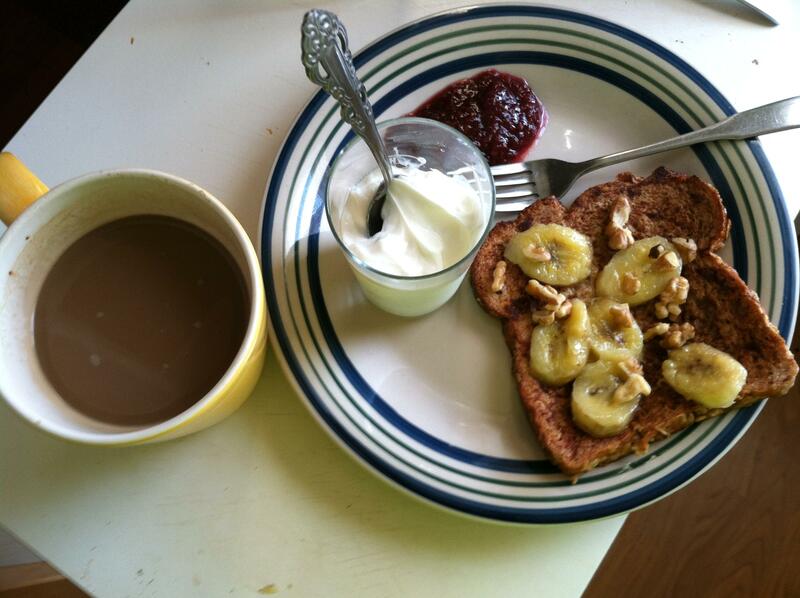 I had my piece with plain Greek yogurt and a cafe au lait on the side. 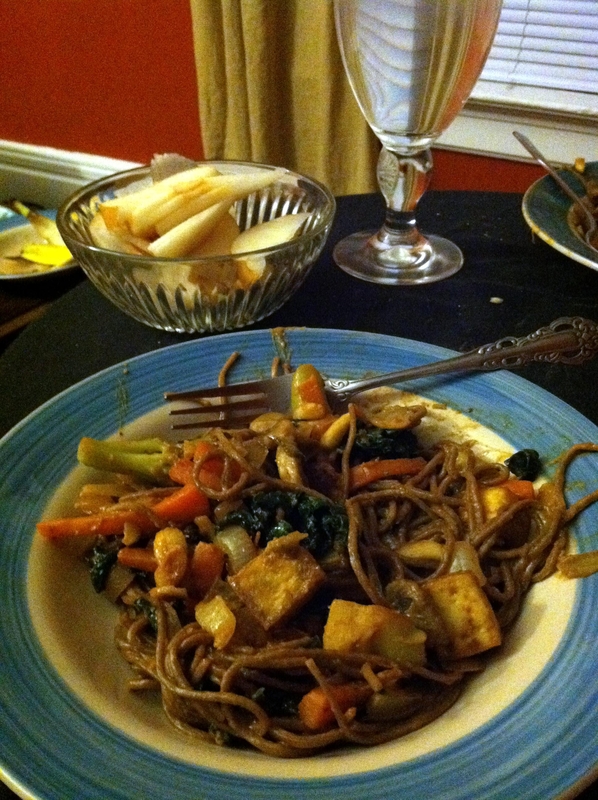 Posted on January 31, 2012 January 31, 2012 by Olivia FecteauPosted in foodTagged brunch, caramelized banana, dinner, food, french toast, peanut sauce, soba, stir fry, tofu.